This is 7 best design tips for making men’s wooden rings. These tips will help you create more masculine designs, and feature rings that are still appealing to both sexes. Here is everything you need to know. Enjoy. 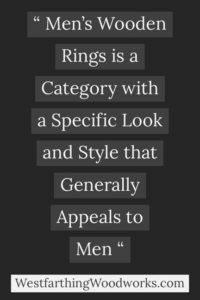 Though wooden rings tend to be fairly unisex, there are some generalities that can be made in order to design rings that are more attractive to the majority of men. Most of these details come from my own personal sales, and what men tend to prefer when they purchase a wooden ring. Many of the design tips that are coming up can also be used to make beautiful rings for women, though the details of size, color, and shape are more common in rings marketed towards men than women. When designing your own line of the rings, it’s important to make a wide variety. Use these tips as a method of creating a particular style of rings, and add that to your design arsenal. 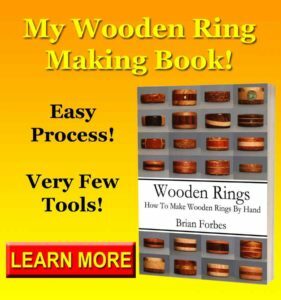 All of these tips will create a cohesive set of wooden rings that will look like they belong together, and show that you can create uniformity in your work. The first tip for making men’s rings is that they tend to be larger and wider in general than rings marketed towards women. Ladies rings tend to be thinner and smaller, which also has to do with the average size of a woman’s hand when compared to a man’s hand. It’s not in common for men’s rings to start around 6 mm and thickness and go well into the eights and tens right away. These thicker bands are very popular, and they also showcase a lot more wood in the overall look. In general, if you’re looking to showcase a bigger piece of wood, think about making a thicker ring size in order to show off more of the material. A larger design will obviously show more wood, and it can be easier to tell from a distance that you’re wearing a wooden ring. To make a line of rings that are specifically going to be marketed towards men, try to stay above 6 mm on the thickness of the ring. Don’t be afraid to go beyond 10 as well, and put out a couple of designs that are in the 12 mm range. These are also very appealing. Darker colors and earth tones work really well for men’s rings. There are some instances to use bright color and a little more punch, but the dominant tone of the rings should be earthy colors that aren’t overly bright. 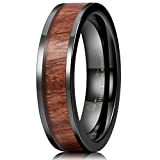 Some of the best types of wood that you can use for a wooden ring like this include Mahogany, East Indian Rosewood, Koa, and Bocote. Each of these wood species is beautiful all by itself, and you can combine them together to create even more interesting looks. All of these species are either some form of brown or a earth like shade that makes the ring very grounded looking and appealing. On top of that, there are a lot of types of wood that are great looking and also inexpensive. However, even if you use a more expensive species you only need a small piece to make a wooden ring. This means you can have fun with some types of wood that you would never buy for other projects simply because you only need a small amount. It may seem really obvious, but the finger hole openings in a men’s ring are different than the finger hole sizes on a women’s ring. This not only reflects the difference in hand size between a man and a woman, but it also creates a little bit of a design challenge. Bigger rings are bulkier, and you can do a little bit more with the amount of visible wood but you also want to make sure it doesn’t get so big that it becomes uncomfortable. Bigger rings can feel bulky, so you have to watch things like your wall thickness and overall shape. Bigger rings can have thinner walls because there is more material still left behind in order to maintain the shape and the strength. This is a limitation in smaller rings because you really can’t remove too much material on a three or 4 mm ring and have very much strength left over. In general, don’t make your wall thickness overly thick for any reason. This will make a ring that’s uncomfortable between the adjacent fingers, and can actually leave a couple of sore spots. Whether for a man or a woman, sore spots next to your jewelry is not a good thing. Avoid designs are overly complex, and instead look for simple designs that are easy to make and repeatable across different wood species. The most classic of these design shapes is a three-part contrasting lamination. In order to make this very classic design, you need two species of wood that contrast enough that you can easily tell the difference between the two. It doesn’t have to be as high contrast as black-and-white, but you do need to be able to tell them apart. Without having to go too far away from each other, even Mahogany and East Indian Rosewood are a good combination that will show enough contrast and a three-piece lamination. All you have to do at this point is decide which species will be in the middle, and which will be on the faces. Mill the pieces down to a third of the thickness of the final ring, and then glue them together in a stack that will be your ring blank. Drill this blank, and shape the ring however you choose. In the end, you’ll have a well-made three-piece design with a very appealing look. If you do want to inject some brighter colors, don’t feel like you can’t. Just because it’s a man’s ring doesn’t mean that it can’t have a little bit of punch. However, rather than making the bright color super obvious, it’s best to make it an accent. An accent color can be done in a number of different ways. The simplest way to do this is using veneer in your lamination. Add a bright colored piece of veneer like Padauk or Purple Heart, and you can add a bright looking accent that is not over the top. You can also simply take one layer of your lamination and use a bright colored species as well. This is still subtle because if you use it to represent 1/3 or less of the design, then it is still well within the accent range. Reds, greens, and purples are actually pretty good for accent colors in men’s rings. It’s enough color that it looks nice, but not so much bright color it can be a turn off. 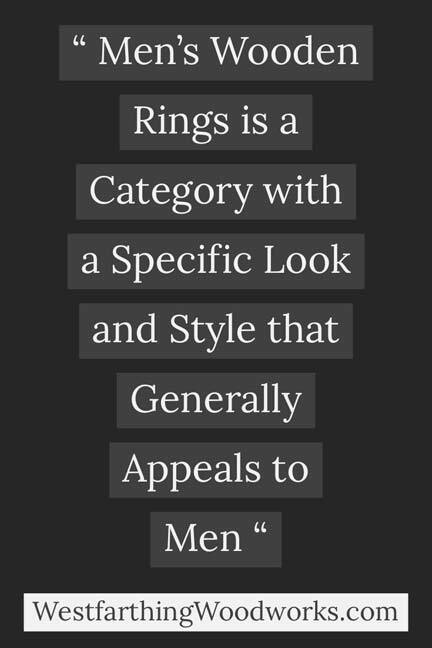 Some men will love the bright colors of course, but most men’s rings are a bit more subtle. Anyone who handles their ring roughly can cause damage, and they are a candidate for a ring that has a metal band on the inside. Sometimes, men can be a little tougher on their jewelry and that means the metal band on the inside is very welcome. Putting a metal band on the inside of a ring does a lot for durability. It makes the ring a lot stronger, and it makes the wearer of the ring a lot less worried about destroying it. This is a huge advantage in selling, because there is a stigma that wooden rings are week. Wooden rings in general are not very weak, especially if you glue them up correctly. However, adding a metal band to the center gives you all the strength of metal with all the beauty of wood on the outside. This is a great way to make your ring stronger. 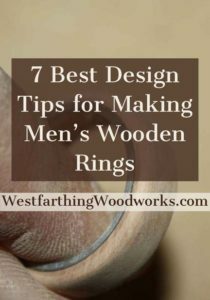 It’s best to use simple shapes and profiles on men’s wooden rings and allow the beauty of the wood to be the forward focus. This means either a flat shape, or a slightly domed shape and profile for each of your wooden rings. This style is very common for men’s wedding bands, and you can see the subtle beauty in the rings that are made of gold and silver for a traditional wedding bands. This is a look that is timeless, and also looks great on a wooden ring. If you must deviate from the standard shape, don’t go too far. You can do something that’s concave if you like, or a little bit more gradual of a bevel, but don’t go too far away from the traditional shape. Most men like a tasteful, and simple shape. Now that you know some of the design aspects that are common among men’s wooden rings, it’s time to start designing your own line of rings. Use these tips to your advantage, and create a cohesive design pattern for your rings. Start with the shapes, and sketch out several simple designs. Then, look at wood species that have earthy colors, dark colors, and strong tones. If you want to add some bold color, think about using veneer or a small slice of brightly colored wood as an accent. The mother of all designs is the three-piece lamination, where two contrasting species are glued up in a stack of three. The layers are all the same thickness, and they alternate light dark light, or dark light dark. Once you create these designs on paper, head out into the shop. Make some laminations, and then create some prototype rings. You will be happy with the cohesiveness in your designs, and the rings will all be gorgeous. If you have any questions on these ring design tips, please leave a comment and I’ll be glad to answer them. Happy building.